It’s not luck or chance or even creative brilliance that got the Harmon Brothers where they are today. As it turns out, it’s a combination of Idaho potato-farm work ethic and corporate libertarianism. 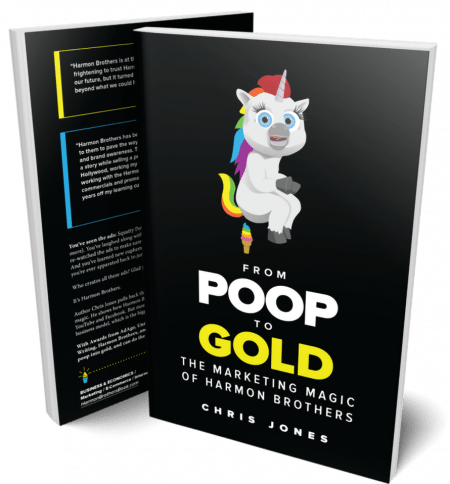 That’s the top line from the new tell-all book about the Provo, Utah-based ad agency behind Squatty Potty’s pooping unicorn, Poopourri’s “Girls Don’t Poop,” Chatbooks’ “real mom” and other campaigns that have collectively logged more than 1 billion views. The executives, whose work has driven more than $300 million in sales for direct-to-consumer brands that include Purple and FiberFix, collaborated with veteran author Chris Jones on the behind-the-scenes book, “From Poop to Gold: The Marketing Magic of Harmon Brothers,” which had its coming-out party last week at VidSummit in Los Angeles. The project, debuting on the heels of the Harmon Brothers University online program, started a few years ago as a way to document the company’s growth and history. It later grew into a book, Daniel Harmon said, when execs saw in black and white the “universal principles” they thought could work for other businesses, entrepreneurs and makers. Harmon spoke to Adweek about giving away trade secrets and educating the next generation, filling the book with Easter eggs and illustrations, and gambling big on a prince and a puppet. Adweek: Why publish a how-to book that lays out your best practices and successful tactics? What about the competition it might bring? Daniel Harmon: It’s really two things. First, there are way more potential clients than we could ever service and way more unmet demand than we can supply in the marketplace. We’re sharing our key principles—on creative culture, process and partnerships—so other businesses can adapt those for their own use. It’s the network effect. We want to help develop talent, and we want other people to be successful. That will come back to benefit us. And second, we want to innovate and try new stuff constantly. If we give away our secrets, that puts pressure on us. We’ll have to keep pushing ourselves to stay on the bleeding edge. This is meant as a primer but not a textbook? There are not as many laughs per minute as in our videos, but we did use our signature humor. We get to brass tacks but in an entertaining way. The last thing the world needs is another dry, boring business book. We used some of our script writers to add jokes, I designed the cover, and we have graphics that show results and caricatures of people we quote. It’s supposed to be fun. And it actually doubles as a stop-motion animation flip-book because the top right corners of the pages show some of the iconic scenes from our videos like the unicorn pooping, the egg drop and the car rolling down the cliff. You’ve included some backstory on a famous campaign that almost didn’t happen? Squatty Potty passed on us, and we lay out that whole situation. 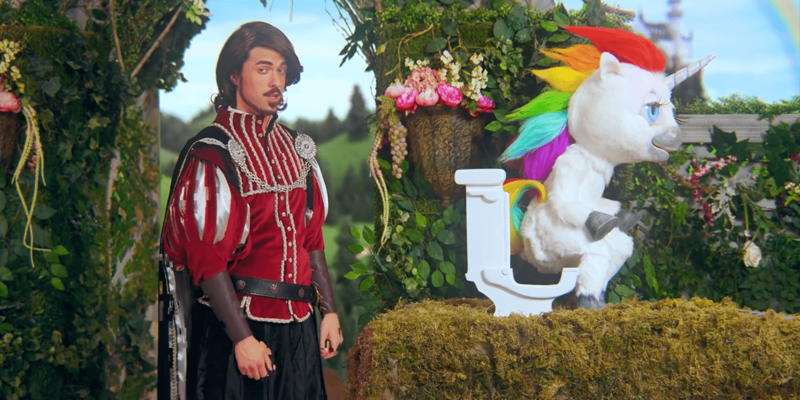 They did not like the pooping unicorn idea—a key investor was not excited about it. And the CEO Bobby Edwards’ parents, who were co-founders of the company, definitely weren’t excited about it. Bobby was ultimately the visionary who went forward with it, and he talks in the book about how frightening it was to trust us. For that concept, there was always in the back of my mind a nagging concern about what was at stake. But we weren’t thinking about building our own brand at the time. We were trying to do something distinctive that would stick in people’s minds. We were betting on the right side of probability, and we thought there was much more to be gained than lost for the brand.